duganA is an American Double (or Imperial) IPA released annually in September by the Avery Brewing Company of Boulder, Colorado. 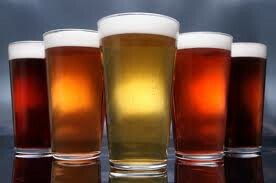 It’s in the more traditional style of American IPAs without the heavy pine of the west-coast IPAs. The nose is super citrusy, with lots of grapefruit and lemon. The middle has some lemon rind, some spiciness, and is quite buttery, which lends well to Avery’s food pairing suggestion, which is to match this ale with creamy, cheesy dishes. The finish has a bit of vanilla, more butter, and is quite dry. The body is medium to heavy and the ABV is a reasonable 8.5%. This is a good effort by Avery and overall it’s quite decent, but there’s too much butter in here for me. This entry was posted in Reviews and tagged American IPA, Avery, Colorado, DIPA, Double IPA, Imperial IPA, IPA on November 22, 2013 by Xander. If I’ve been noticeably absent this past couple of weeks, it’s because I’ve been moving. Which is a huge pain in the rump, I might add. However, things are settling down and this is the first review from the new house, so enjoy. 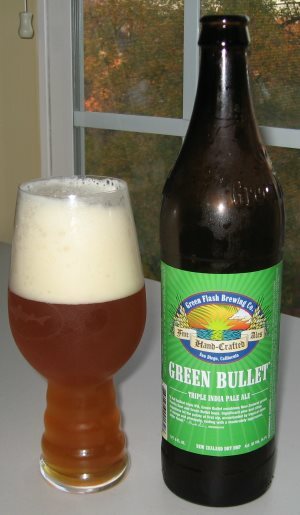 Green Bullet is a winter seasonal Triple IPA from Green Flash Brewing in San Diego. It’s a super hoppy IPA in the West Coast style that Green Flash does so well, with extra helpings of body and alcohol. There is pine and lemon in the nose, pine and grapefruit in the middle, and pine and just a hint of sweet orange in the finish. The 10.1% ABV and the additional dosage of hops means that this is a beer that should keep well if you want to pick up a few extra while it’s in stock (through December 2013.) This is a West Coast IPA at heart, with nothing particular unusual in the flavors, but the imperial nature really does make it a nice winter treat when a thinner beer just won’t do. It’s a nice, simple idea, well executed, and a fine treat. This entry was posted in Reviews and tagged American IPA, California, Green Flash, Imperial IPA, IPA, Triple IPA on November 19, 2013 by Xander. 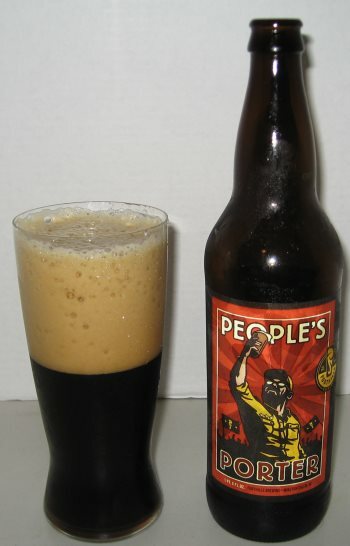 People’s Porter is a classic English Porter from the good folks at Foothills Brewing in Winston-Salem, North Carolina. It’s dark and roasty and chocolatey and lovely, but not too heavy, or particularly big, at 5.8% ABV. This is the sort of beer you drink when you want a dark, roasty beer but not a meal, or a dessert. It’s bursting with great flavors, the aforementioned chocolate, along with coffee and a nice nuttiness in the finish. This is a very well executed English Porter, and highly recommended. I give it a 4.1 out of 5. This entry was posted in Reviews and tagged English Porter, Foothills Brewing, North Carolina, Porter on November 6, 2013 by Xander. Ranger IPA is New Belgium Brewing’s year-round IPA offering. It’s a fairly classic interpretation of the American IPA, floral and hoppy. The nose is predominantly floral with a hint of lemon. The middle and finish have grapefruit notes and a slight, slight undercurrent of pine. It’s light in color, and fairly light in body, and really nice rendition of an American IPA. This entry was posted in Reviews and tagged American IPA, Colorado, IPA, New Belgium on November 1, 2013 by Xander.